…and the coming financial catastrophe. No one wants to hear about the State of the Union speech (SOTUS). Full of bluff and bluster… lies and claptrap – all of them are best forgotten, and fast. But we return to last week’s SOTUS, as to the site of a murder, not to bury the corpse but to praise him. For there lies DJT… Donald John Trump… slain. Like Caesar, smitten in the Capitol, but by his own hand. Our guess is that he will never rise again. A further guess is that he will take the nation down with him; we will look at those dots tomorrow. The problem with his SOTUS was that it failed to mention anything that might be meaningful or helpful. That is, it avoided any mention of the real state of the union. Who would report on a company and fail to mention that it was $22 trillion in debt… and was, at the time, losing money at the rate of approximately $100 billion per month… and that it had no plans – or even hope – of cutting its losses or heading off a monumental debt crisis? Who would assess the state of a country without reference to the fact that it was slipping in every measure that matters – wealth per capita, business startups, patents, freedom, equality, and the integrity of its institutions? What kind of a Commander in Chief would describe brave and heroic achievements from more than half a century ago, but lack the courage to confront an ongoing pattern of wasted lives and wasted trillions spent on military adventures with no coherent strategy, no possibility of victory, and no foreseeable end? Alas, Mr. Donald J. Trump is that kind of guy. 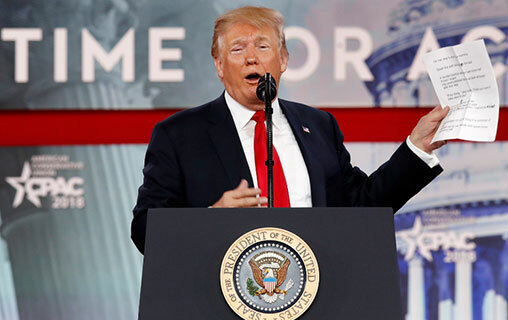 Trump’s New SOCIALIST POLICY? Take Action by March 15th! Because redistributing $5 trillion of wealth doesn’t seem very Trump-like. Still, most Americans are NOT complaining. What about you? And yet, it might have been so different. It was he who called Pentagon spending “crazy.” He said his predecessors had created a “big, fat, ugly bubble” in U.S. stocks. He said he saw the decline of the U.S. and offered to make it great again. And so… last week, it was DJT’s last great opportunity to put his cards on the table. It was a chance to validate his campaign promises… to bring some sense of purpose to his administration… and to his life. Born with a silver spoon in his mouth, and taught by Roy Cohn, one of the sleaziest scalawags in U.S. political history, and held back by neither scruple, dignity, or peer pressure, Mr. Trump is unique in White House history. No one expected Barack Obama to turn the tables on the insiders. Nor Hillary Clinton. Nor George Bush. They were all insiders themselves. But Trump? He was right again, in a way, saying that “only he” could fix the system. He spent his whole life as an outsider – ridiculed and disparaged by the elite – preparing for it. Lying about his wealth, shamelessly building his brand, making a public spectacle of himself in newspapers, magazines, and on TV… and for what? And then, against all odds, he won the world’s elected office. It was a remarkable achievement by a remarkable man. Trump defied them all – the party bosses… the pundits… the pollsters. And he won. And wouldn’t it all be worth it… all the sacrifice and buffoonery… if he could one day stand on the podium and nudge the nation, even just a little, in the right direction? But we wanted to see how far it could go. But that is the problem with politics. If you want to be elected, you have to pretend to care about people you’ve never met, and greet total strangers as if they were long lost friends. So, too, you must dissemble about everything: You claim to have solutions to problems you don’t understand in the slightest… identify enemies who’ve done you no harm… and offer to rip off someone, somewhere, sometime in the future so you can pay off the cronies and zombies you need to get you elected today. You have no time to think seriously about how a government should work… or what makes for a peaceful, prosperous society. Who would care anyway? All you have left is the claptrap and lies of campaign slogans and stump speeches. And by the time you get to the White House, so much time and energy has been spent acting like a fool, that you’re no longer acting. You have become the jackass you pretended to be on the campaign trail. This is a syndrome that has afflicted every president, to a greater or lesser extent, at least since Calvin Coolidge. Even Mr. Trump, for all his strength of character, couldn’t resist. And so, his SOTUS took off like a rocket, soared into the clouds of America’s Great Past… and sank into the swamp of America’s tawdry present… leaving not a trace of dignity, honor, or intelligence floating on the surface. Last week, we showed you that gold outperformed U.S. stocks over the last 20 years. And if Bill is right, gold will also be a good investment in the years ahead. Today’s chart tracks global investment dollars moving in and out of gold-backed ETFs each month since the start of 2018. 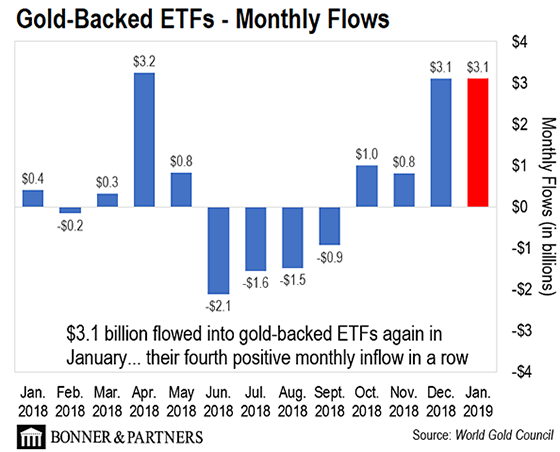 As you can see, $3.1 billion flowed into gold-backed ETFs to start 2019… for the second month in a row. Since October, a total of $8 billion moved into gold-backed funds. This coincided with a fall in stocks. The S&P 500 shed 573 points, or roughly 20%, from October to late December. 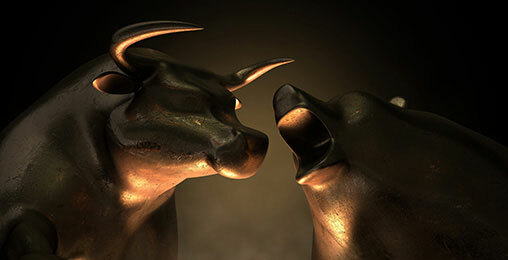 These moves make it clear – the market still views gold as a viable investment during times of market turbulence. And as Bill has written, the U.S. must still contend with a looming economic slowdown… ongoing trade wars… and a potential reversal of rate hikes this year. If these trends pick up, expect even more investors to jump into these gold funds in 2019. Electric cars are the future. Just ask the government! The U.S. has spent billions trying to convince Americans to drive electric. The official reason: To protect the environment and boost economic development. And that’s true… sorta. Fifteen years ago, the company that would become “Facebook” was born unto the world with the bold ambition to connect the world and make it a better place. Fifteen years… several data breaches… rising rates of social media addiction… and skyrocketing levels of teen depression later, it’s safe to say Facebook failed. The Left wants to eliminate the Constitution and create a socialist totalitarian regime. It is the Right that wants to eliminate the Constitution and create a fascist regime. Where are our centrists, who created the United States of America, and built it into the nation which was once the ideal of the world? Have they all gone one way or the other? Good thoughts from today, Bill. Red vs. Blue, conservative policies vs. socialist policies…The world of beneficial solutions is rarely clear cut. For example, there is always a price to pay in dealing with the most needy in society. Conservatives want to pay one way and socialists want to pay another… but all do pay! 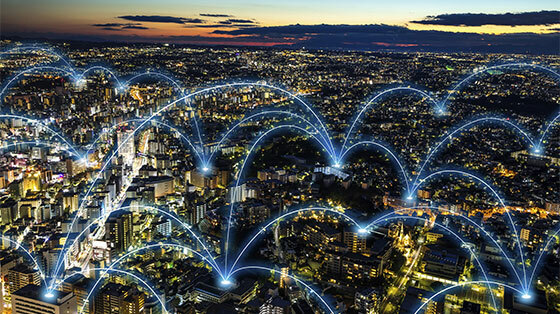 The key is trying to get the balance right… philosophically, morally, and economically… so that the cost of any solution results in a net lasting benefit to the whole community. Stay the course. I enjoy your insight and to heck with those who don’t understand your sense of humor or think it matters whether you are a Republican or a Democrat. I used to work for a poor guy. I didn’t always get paid. Then, I worked for some rich guys and got paid regularly. I probably helped the poor guy stay in business longer than he should have, ‘till he finally lost it all. I’m sure I helped the rich guy get richer. Now, I work for “them”… the U.S. government. 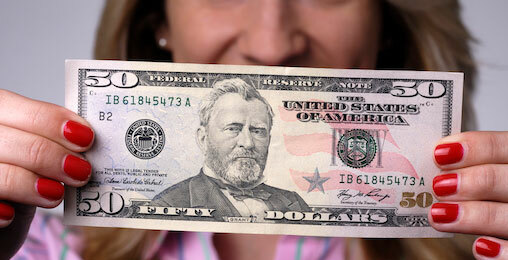 It’s not funny, but I don’t always get paid any more, even though they print the money. I work for the United States Air Force, to be specific. I did it for job security. The pay wasn’t bad, but not the greatest either. It provided for our family. Now, the kids are gone and it’s just the wife and I. I’ll retire in a few years. I’m concerned about what is in store. Where I have worked the last 32 years, most of us work hard and do our best to be productive. What do we produce, you ask? Paperwork, reports, studies, etc. Nothing of value. Is it all necessary? NO! Dang, honesty really bites. But, at least some of what we do is important. I have to say that so I can hold my head up high and sleep at night. Keep up the good work. We’re taking another brick off the wall called liberty and justice for all. They’re going to control all of us as well. On the point of spending, I totally agree. Thirty trillion in debt by 2023-2025. Throw 3.5% interest on that and you’ve got $1 trillion in interest. Far greater than what’s forecasted. I don’t have the chart, but my guess is the only GDP growth we have is a direct result of increased spending. Bill, you’re certainly no Leftylib. Anyone who advocates, as you do, laissez-faire, less government, suppression of the foxes, win-win, free-market deals, and does his own dirty work is no Leftylib. Those who take you to task are proving your point: They are “us against them”-ers. As for me, I keep waiting for another down-on-the-farm, epic barnyard conflagration, visible from space, only… please use a non-volatile accelerant this time (diesel fuel, kerosene, used engine oil, etc.)! Internet service providers – companies that hook up internet to your home – are the most-hated companies in America. They charge Americans exorbitant prices and they never show up on time! But Jeff Brown, Bill’s go-to technology expert, says that’s all about to change. And smart investors stand to make a small fortune when this “Wi-Fi killer” hits American homes. Full story here.